The virtual construction department plays a critical role in both new construction and renovations projects. Through the use of programs such as Revit and Navisworks, the implementation of the building information modeling (BIM) workflow provides our project teams with information relating to spatial program validation, clash detection, and quantity take-offs. The BIM workflow incorporates the use of 3D modeling, scheduling (4D), and costing (5D) with an integral database to allow for the capture of rich information associated with a given project. The department provides services that span from the design phase through construction and sometimes, into the operations and maintenance phase of a project. Additionally, the department works with the marketing department in proposal and presentation preparation addressing site logistics and demonstrating Mascaro’s understanding of the project. Estimating: When a model of sufficient detail is provided by the designers, Mascaro can automatically extract quantities from the model, reducing the workload of the estimators, increasing the accuracy of the quantities produced, and ensuring that the subcontractors are able to provide accurate quotations. Logistics Planning: Mascaro can either create our own models for the purpose of site logistics planning, or add to the A/E provided design models to create a fully comprehensible site logistics plan that can be transferred to all members of the project team. Schedule Linking: Mascaro can dissect and reconstruct the A/E provided design models to incorporate the schedule activity IDs into the properties of the modeled objects to allow the model to be fully linked to the project schedule. 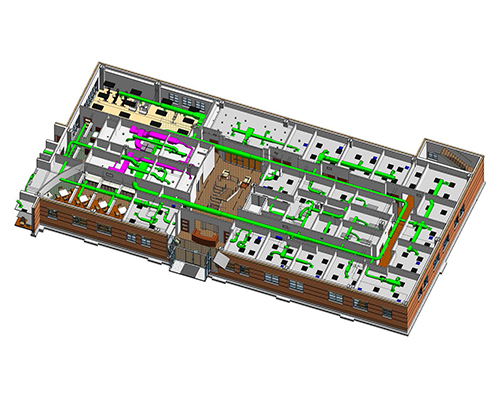 Enhanced Information: Mascaro has the ability to incorporate design, construction, and as-built data into the modeled objects to allow for the transfer of information from the construction team to the operating team and/or integration with facilities management software. During the construction phase, Mascaro can utilize Navisworks to produce comprehensive 3D visualizations of the project, with the work of all project team members depicted in a single 3D federated model. At this stage of the project, Virtual Construction provides a higher level of communication and understanding of the documents to ensure that the final product meets the intended design. This helps to keep the trade contractors focused on a common goal, as they can physically see how their work impacts and/or is impacted by the work of others.